Biotechnology is rapidly evolving through developments in genome editing and synthetic biology , giving birth to new forms of life. This technology has already given us genetically modified (GM) plants that produce bacterial pesticides, GM mosquitos that are sterile and GM mice that develop human cancers. Now, new biotechnological techniques are promising to deliver a whole host of new lifeforms designed to serve our purposes – pigs with human organs, chickens that lay eggs containing cholesterol controlling drugs, and monkeys that develop autism. The possibilities seem endless. The biodiversity of life on earth is globally recognised as valuable and in need of protection. This includes not just wild biodiversity but also the biodiversity of agricultural crop plants that humans have developed over thousands of years. But what about the synthetic forms of biodiversity we are now developing through biotechnologies? Does anyone care about this synbiodiversity? It’s a question I was compelled to ask while conducting research into the Svalbard Global Seed Vault ( SGSV ). The SGSV is the global apex of agricultural biodiversity conservation, an approach to conservation where collections of diverse seed samples are kept in frozen storage in genebanks for future use by plant breeders. The SGSV is a frozen cavern in a mountain on the arctic island of Svalbard, halfway between mainland Norway and the North Pole. 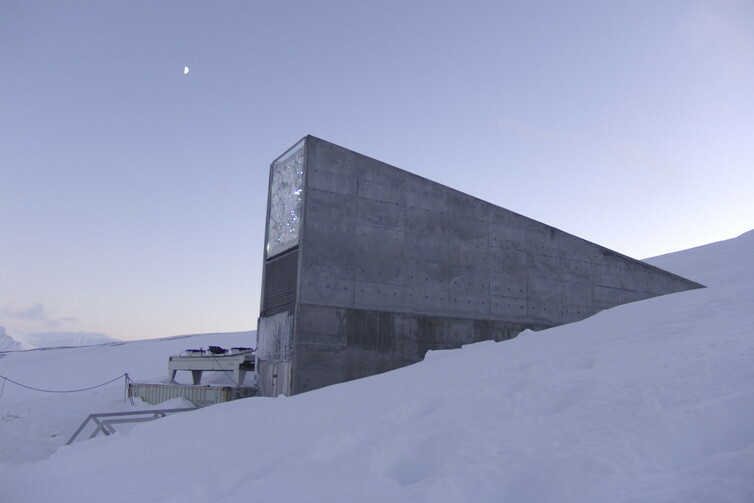 It has been called a Noah’s Ark for crop plants (also the “ doomsday vault ”) because it is the place where genebanks from all around the world send backup copies of their seed collections for safe-keeping. Here the seeds are sealed inside bags sealed inside boxes locked in a freezer locked in a mountain. They are sent there to be kept safe from the threats gene banks can face, such as energy shortages, natural disasters and war. Seeds in the SGSV can only be accessed by the genebank that deposited them and only one withdrawal has been made so far, by researchers from the International Center for Agricultural Research in the Dry Areas ( ICARDA ) seeking to restore their collections after the destruction of Aleppo in war-torn Syria. The SGSV is managed through a collaborative agreement between the Norwegian government, the Crop Trust and the Nordic Genetic Resource Center ( NordGen ). It opened in 2008 and currently houses 870,971 different samples of 5,340 species from 233 countries, deposited by 69 institutes. Are there any GMOs frozen in the vault? During my research into the SGSV I asked if it held any GM seeds. Despite initially receiving conflicting responses, the formal answer was ultimately “no”. But different reasons were given for this and all are open to change. Facilities working with GMOs require certification to do so. While the SGSV is not currently certified, it could be since requirements typically relate to ensuring strict containment and the SGSV is already oriented towards this goal. Also, since no analysis of seeds is performed at the SGSV or required for deposits, the collections may actually be unintentionally (and unwittingly) contaminated. This is because a mixing with GM crops could have happened via seed or pollen flow before the material was sent to the vault. Currently, no one in the SGSV management wants to become (any further) entangled in the controversy surrounding GM crops. They already face what they see as false conjectures about the role of the biotechnology industry (fuelled no doubt by the fact that organisations involved in the biotechnology industry have donated funds to the Crop Trust ). Several of the depositing genebanks also actively support biotechnology research . Therefore, if they wanted to store GMOs in the future, the will to seek certification may certainly change. Norway has a strict GMO policy that requires not just evidence of safety but also of social utility and contribution to sustainable development. This means no GM crop has yet been approved for either cultivation or import. But this is currently being challenged by a government committed to speeding up assessments and advocating for weakened interpretations of the law. This further indicates the potential for political will to change. The International Plant Treaty is a crucial foundation for the SGSV. As such, depositing genebanks are required to agree to multilateral access to their collections if they wish to deposit backup copies in the SGSV. But GM crops are not freely accessible to all as part of the common heritage of humanity. They are patented inventions owned by those claiming to have created them. The SGSV requirement that deposits be available for multilateral access can be waived though. As the fields of genome editing and synthetic biology are now undergoing rapid development though, we have an important opportunity to consider how we relate to biotechnological forms of biodiversity. We can also think about whether it might be possible to navigate through syn- to symbiodiversity . The French sociologist of science and anthropologist Bruno Latour has urged us to love our monsters , to take responsibility for our technologies and care for them as our children. Certainly it seems fair to argue that if we don’t care for our biotechnological co-creations with a sense of (parental) responsibility, perhaps we shouldn’t be bringing them to life. So this leaves me questioning what it is we really cherish? Are we using our precious agricultural resources to expand the diversity of humanity’s common heritage? Or are we rather placing our common heritage on ice while we expand the ecological space occupied by privately owned inventions? And who cares about synbiodiversity anyway?